An exhibition not to be missed, especially if you are interested in how artists respond to the natural world. These three artists, who live in Fife and Northumberland will be showing a diverse selection of paintings, drawings and prints which reflect their shared interest in trees. They explore all aspects of trees, including woodland, leaves, bark and trees in the landscape. Each artist approaches the subject from strikingly different perspectives though always from the starting point of observing and studying directly from life. Sheila Page draws mostly in pastel and charcoal. 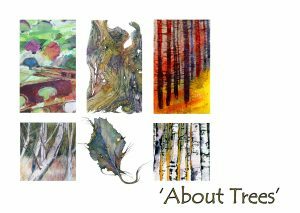 Over recent months she has spent time exploring a small area of birch woodland near her home and her work shows the visual development of the tree forms, as Spring gives way to Summer and Autumn. Jane Murray, who exhibited stunning ink and watercolours of vegetable forms at the Arthouse in 2014, is focusing this time on detailed studies of bark and leaves and larger pieces, based on studies of old and dying oaks, which are moving towards the abstract. Renira Barnes is influenced by the way green spaces, both environmentally and mindfully, can renew and heal. Recent work explores how trees mark our physical and mental journeys. Her paintings, usually in watercolour and acrylic, are developed from sketches and photographs which have recorded the immediate. All welcome to the opening event on Saturday 14 October from 10 30 am.